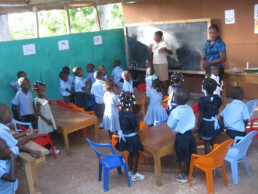 A few weeks ago, eighty-five children way up in the mountains of La Gonave completed their very first year of school. Ever. They started with nothing, essentially. To house it, we found a dilapidated and abandoned, tiny old church building that was pretty much unsafe. The walls were crumbling and the roof, well, you didn’t want to stand under it. And most of the village’s children were sickly and malnourished, which is what happens when you don’t eat every day. The village desperately wanted a school. We told them that if they could make the building safe, we would provide them with some supplies for the task. Inspired, they cut the walls down to half their original height and stripped the roof of everything but its wooden frames. We found the biggest, heaviest tarp we could find for a roof, the kind semi trucks use to haul loads. They partitioned off the inside. They built benches. They built blackboards. We spent very few dollars to ready the structure. A thousand dollars at most. We would pour more into people. 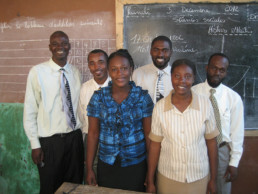 We found capable and energetic teachers and a very good principal. We figured out how to provide the children with a meal every day. We registered the school with local island jurisdictions. We provided them with basic supplies for conducting this place of learning. We provided them with a flag and a school bell. Children wore uniforms made right there on the island. They chose blue as their color. In form, they were unlike any other school. Their building, barely a building. Except for their benches and chalkboard, their classrooms were bare of things that would look like a place where learning happens. In function, they were as much a school as any other school in the world. They met every day. The teachers wore dresses and ties. They took attendance. They administered tests. They issued report cards. Learning happened. And not just the kids! We have learned, too, the village and us. We have learned how to listen and cooperate and be patient and forgive. Turns out, learning is not the only thing that has happened in one village in the mountains. Quite a bit of grace is goin’ on, too. Makochon’s school is growing this year, in both function and form. 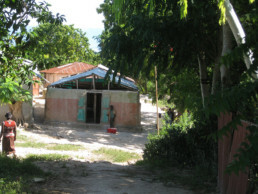 A fourth grade class is being added and the village is looking for a site where they can build a new school.